Now on 64.5 points to second placed Hong Kong’s 100.5, the Irish team’s position at the Rolex Commodores’ Cup is looking all but unassailable. With just one inshore race to go tomorrow it would now take a major disaster in all three classes for the immaculate Irish to lose their grip of the trophy that has eluded them for so long. 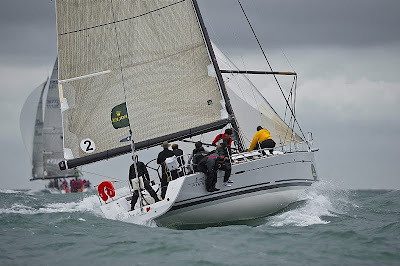 Today the 29 strong fleet (one down with Paul Turner’s Artemis in GBR Black out of the competition with a damaged keel) sailed anti-clockwise around the Isle of Wight, the results from this 55-nautical-mile carrying a points co-efficient of 1.5x. This was held in southwesterly wind that peaked at around 24 knots as the boats battled their down the western Solent towards the Needles in lumpy wind against tide conditions. In the big boat class, Anthony O’Leary’s Ker 39 Antix scored another win, her fourth this week, giving her by far the lowest points score of all the boats at the Rolex Commodores’ Cup. She won on corrected by a minute, once again from her sistership, Bernard Gouy’s Inis Mor racing in France Yellow. “The start was very tricky,” commented Dave Lenz, Antix’ tactician and one of the crews two permitted professional sailors. “There was tide, not much breeze and while you weren’t crossing the line on starboard, you wanted the left because of the effective bias there.” Surprisingly only one boat, Inspara (RSA), was swept over the line by the tide and had to re-start. Antix did well heading down the western Solent, managing to get into clear air which Lenz says was key. At the Needles the going got very bumpy thanks to the strong wind and tidal situation. “It was quite rough down there - we saw 23-24 knots and some short sharp pretty big waves.” From the Needles the wind dropped to around 17-19 knots, but they were pushing tide which momentarily turned in their favour after they rounded St Catherine’s Point, the southernmost tip of the Isle of Wight, turning foul again as they approached the eastern entrance to the Solent. “I thought it was going to be lower visibility, but it was alright,” concluded Lenz. In the medium and small boat classes, it was a good day for France with a win for Géry Trentesaux and Marc de Saint Denis’ First 40 Coup de Coeur for France Blue in the former and Marc Alperovitch and Jerome Huillard’s A-35 Prime Time for France Yellow in the latter. As to the level of competition this year Saint Denis thinks it is very good, but that now the Irish team is virtually untouchable. Among the small boats today’s winner Prime Time made a good start, but suffered on the leg from the Needles to St Catherine’s Point when they did not go in close enough to the Isle of Wight to get out of the tide. “At St Cats we weren’t too bad and then we really pushed hard after that,” said helmsman Jérôme Huillard. “And the reach on the way back went quite well and we worked really hard on the boat because we knew it was going to be down to seconds.” In the event the small boat class today saw the closest finish with Prime Time correcting out just 18 seconds ahead of Francois Blossier’s A-35 sistership RealAx, which scored her best result of the regatta. Unusually French boats took the top four spots in the small boat class today. “The boat is going fast, not in all conditions but today was okay. On a reach we are not super good, but today we really worked hard,” concluded Huillard. South Africa continue to suffer at this regatta, now lying in eighth place overall. Small boat in the team is the J/109 Inspara, skippered by David Hudson. Hudson runs the Race Ahead, an organisation that aims to nurture sailing talent among under privileged youths in South Africa. Aboard for this regatta, his stars in the making are Wandisile Xayimpi and Marlon Jones. The 2010 Rolex Commodores’ Cup concludes tomorrow, Saturday, with a single inshore race at 10.30 BST. The final prize giving will be held at the Royal Yacht Squadron at 17.00 BST.